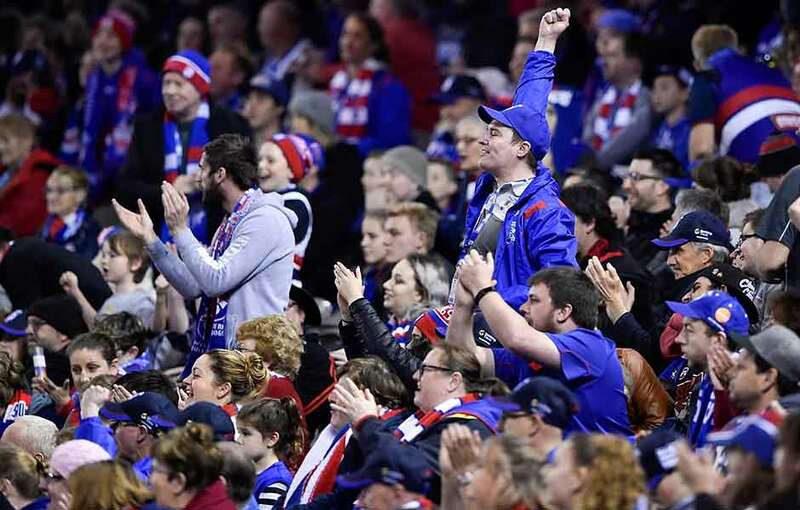 The Western Bulldogs have announced a total profit of $18.094 million for the financial year ended October 31, 2018. The result comprises a Profit before Redevelopment Activities of $2,207,274 and a Profit from Redevelopment Activities of $15,887,059. The financial result is up from $1.643 million in the previous year, and is the fourth straight year the Club has posted a profit (before redevelopment activities and asset write-offs) in excess of $1 million. The profit from redevelopment activities is derived from the recognition in the Club’s accounts of the value of the freehold land assigned to the Club by the State of Victoria at the Whitten Oval precinct, income from the redevelopment grant received for the upgrade of the VU Whitten Oval facilities for AFLW and includes expenditure related to redevelopment activities as detailed in the financial report. The financial outcome elevates the net assets of the Club to a total of $45.8 million, with cash available of $7.9 million (up from $3.9 million in 2017). The Club remains in a position of having no bank debt. “This is an outstanding result, which everyone at our Club should be proud of given their own individual contributions,” said Bulldogs’ CEO Ameet Bains. “We would like to thank all of our loyal members, staff, players and Board for their continued hard work, and our various football, corporate and community partners for their unwavering support. “This result was achieved with a reduction in competitive balance funding from the AFL. “It also came after an unprecedented increase in revenue from the Commercial Partnerships arm of the organisation, which achieved revenue in excess of $12 million for the first time. “In particular, we are proud we could celebrate 10 years as a major partner with Mission Foods, and welcome Mercedes-Benz Vans as our principal partner. “While we saw an overall loss in membership numbers last season, we are encouraged by significant increases in AFLW and Ballarat membership categories – important strategic objectives for the Club - which helped drive overall membership revenue to $7.59 million. “The Club continues to invest heavily to support its impactful suite of community programs, which deliver crucial outcomes in a number of streams, throughout the western corridor of Melbourne and Victoria. “We are extremely pleased with the Club’s financial position, but remain acutely aware of the need to grow our revenue streams to fund an expected increase in costs across the business over the next few years. “The Bulldogs’ Board and executive are working to carefully plan our exit from gaming machine ownership, as well as plan for costs associated with the ambitious plans we have for the redevelopment of VU Whitten Oval and the broader Western Oval precinct, one of the most exciting projects in the Club’s history. Peter Gordon and Ameet discussing the results and development of the ground. wealthiest Clubs in the AFL. In a way that's almost as good as winning flags. Just to know that the club is safe and secure and no *!*!*!*! can try and take it from us is a huge relief. Very proud of what Peter, Ameet and the team have been able to achieve. The fact that we have been able to achieve 4 x $1M profits in the last 4 years is fantastic endorsement of how the club has been managed during an unprecedented era of growth which is often a very challenging task for businesses who aren't prepared. Can you imagine what is possible for our great club if we can back this up with $2m type profit performances over the next 2 or 3 seasons? Congrats to all concerned at the club, thank you so much for your hard work and dedication. Now let's do what rich clubs do, grab a bunch of Cat B rookies to further sprawl out our list beyond Khamis at the sole Cat B currently. Nice to know the money that was so hard to get, is being used well. From memory, if Labor got re-elected they were going to help line our pockets through Ballarat next year and beyond. Labor won. So hopefully that bodes well. I seem to remember test we were promised the spare land over Cross st and underneath the railway bridge if Labor won as well. We can have that too. Edit: we got it in April irrespective of the election outcome. The Club has acquired a key parcel of land at the southern end of VU Whitten Oval for the Club to develop, as well as a $5 million grant from the Andrews Government to improve football facilities with an emphasis on women’s change rooms, toilets, a scoreboard and TV quality lighting for future AFLW home games. We are now in third place, nearly $9m ahead of the next placed Bummers. Only the very rich Hawthorn and WC are ahead of us. I am truly amazed at the value of land ($16m) we have been granted and thrilled at the operating result. $3 million more of state government funding to come for the Whitten Oval next year as well - we got $2m this year according to the report. Now let's get the team winning again and the declines in our membership, gate receipts and merchandising returns will be reversed. That $2 million will be for new changing rooms for the AFLW, as well as a scoreboard and some other improvements. True, and the money next year will go to public toilets and improved lighting and probably some other improvements. I wonder if there has been any movement on our terrible stadium deal since the AFL took over. I know that when they took the keys they were doing their best stall tactics on any negotiations.